Something a little different for today. Our daughter Sofia had her full-on dress rehearsal for her dance recital tomorrow night. She attends Reverance Dance Academy and every year they put on this wonderful show, with each class and style of dance putting on a routine for the parents and relatives (and anyone else) to come watch and raise money for the academy. This year, Sofia took the Jazz class and she put on quite a show. Check it out below. Posted in General and tagged Reverance Dance Academy, Sofia by greggl with no comments yet. Spent some time in our yard photographing the blossoming trees we currently have. 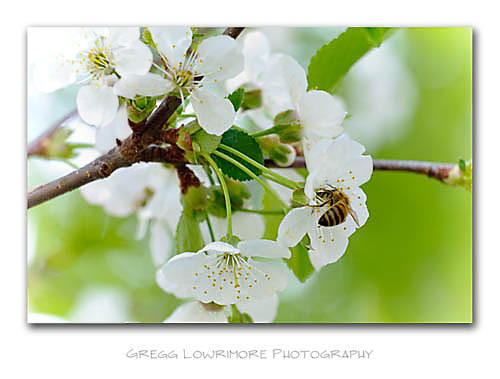 Here’s an image from our Cherry Tree. I must have waited 30 minutes for a bee to land within my composition! Posted in Landscapes and tagged cherry blossoms, flowers, spring, springtime, trees by greggl with no comments yet.